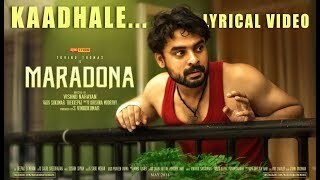 Kaadhale song Lyrics from Malayalam movie Maradona. Lyrics of Kaadhale is drafted by Vinayak Sasikumar. Kaadhale song is sung by Sruthy Sasidharan. The Album features Tovino Thomas, Sharanya R Nair in lead roles. Lyrics to Kaadhale song,Kaadhale song translation in english. Malayalam Movie Maradona Kaadhale song Lyrics, this song cast Tovino Thomas & Sharanya R Nairin prominent role.Sruthy Sasidharan's voice & lyrics written by Vinayak Sasikumar, its track composed by Sushin Shyam Maradona 2018 Kadhale Kathale with lyrical video.